Prominent Israeli journalist GershomGorenberg offers a penetrating and provocativelook at how the balance of power in Israel has shifted toward extremism, threatening the prospects for peace and democracy as the Israeli-Palestinianconflict intensifies. 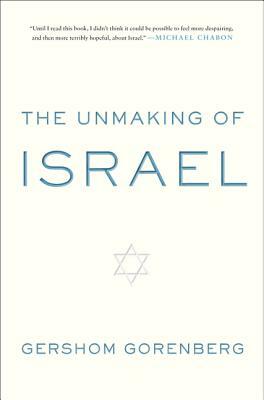 Informing his examination using interviews in Israel andthe West Bank and with access to previously classified Israeli documents, Gorenberg delivers an incisive discussion of the causes andtrends of extremism in Israel's government and society. Michael Chabon, Pulitzer Prize-winning author of The AmazingAdventures of Kavalier and Clay, writes, "until I read The Unmaking of Israel, I didn't think it could bepossible to feel more despairing, and then more terribly hopeful, about Israel, a place that I began at last, under the spell of GershomGorenberg's lucid and dispassionate yet intenselypersonal writing, to understand. “[Gorenberg’s] book is solidly researched and elegantly argued. It combines history and analysis, love and anger. Somehow, it avoids moralism. If you read one book on Irsael, this shoud be it.